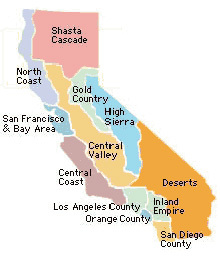 San Diego County runs along the Pacific Coast; from Orange County on the north, to the Mexican border on the south, to the Deserts Region on the east. It is the largest county in California (4,200+ square miles) and San Diego is the 5th largest city. San Diego County has 70 miles of coastline, a year-round temperate climate and is known as "the yachting capital" of California. You'll also find the San Diego Zoo, golf courses, museums, theme parks, great shopping, dining and nightlife, in addition to scenic hiking, biking and equestrian trails, great surfing, camping and wine tasting.